Thanks for all your prayers and concerns. I brought my son to the doctor today and he is now being referred to a heart specialist. Right now his heart beat is okay but just for pre caution, it is better to go for a thorough check. Now that my mind is more at rest knowing nothing serious ….. I am off to my kitchen. ………. I have tons of books but most of them, I just adored the pictures and then they are left sitting pretty on the shelves. These days, I have to refrain myself from buying more books. Being not so proficient in reading Chinese ingredient list, my Chinese recipe books are very limited and generally books that are bilingual are not that worthy. After trying the milk bread yesterday, I knew this book has some substance. So I am more confident in attempting another recipe. This time round, I chose Healthy Rye Loaf. There is one ingredient that is missing but nevertheless, I still went ahead with it. The texture of this dough is “hard” unlike the Milk Bread that I tried yesterday. It also didn’t increase volume too much in the first proof. But shaping this loaf is much easier. 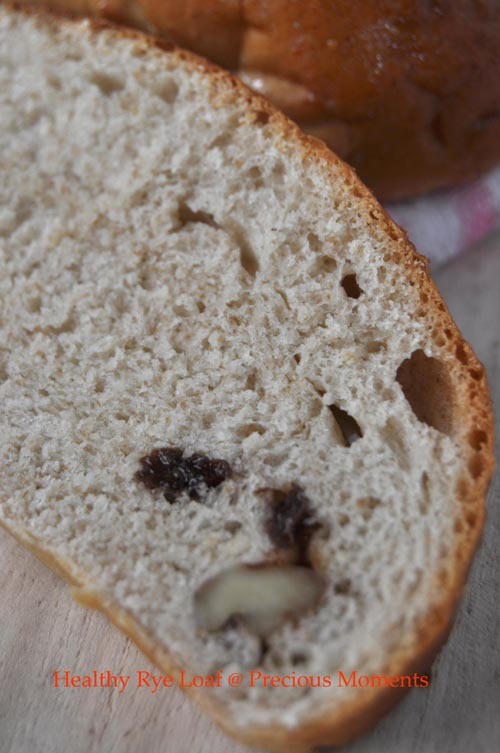 I overlooked not incorporating the walnuts and the raisins in the final kneading thus resulted in my nuts and fruits being loop sided. Doesn’t it look like some freak with two eyes? The texture is really nice. Soft and fluffy, a sweet tone too. I will increase more raisins next round as I like the soft fruits between bits. I am sure my hubby will like this too as there is nuts! Perhaps if I have a chance that someone goes overseas, I might seek her/his help to buy me a copy. (yes, I am very lousy with online shopping and when the sites is full of Chinese words, I become paranoid). Glad to hear that your son is alright! Good to know your son is fine ! And your bread certainly looks good for a breakfast ! i did have the same experinced forgetting adding the seeds or nuts in my bread before proofing and when i did, they just appear on one side of the bread. But that's okay cos we are not selling the. It's been quite some time that i did a really soft bread.Just read your previous post and am glad that your boy is better now. So has the lump goes off ? Btw, glad to see you start working on breads. I bet your kid will be very happy to have such fresh fluffy homemade bread for the next couple of days....or weeks! haha..... I bet you'll get addicted to it. Have fun & enjoy your day. hopefully the heart specialist comes back with a clean bill of health :) and ur bun looks good! Good to know your son is alright. Phew ... that bread of yours looks good and healthy. Thanks Anne, he is going for the last test on 3 April. Hope he will be ok.
quizzine, he has one last test before declare he is ok. Go bake. Kristy, I was worried sick and I can understand what you went thru. This son of mine is pro to accidents too. When he was young, he caught bronchitis from me and then developed asthma. Luckily he is okay now after I weaned him off steriod and seek chinese medicine treatment. Let's pray he won't be like me, when old then have asthma. Janine, yah I pray so. I am sorry to hear about your son. It sounds quite scary and I hope nothing like this happens to him again. Thank god your helper was around and thank god he didnt faint and hit on something. Sometimes when people faint and fall, if the impact is quite hard on their head, something can happen. Hi Edith, Glad to know that there is nothing serious and your son is OK. It is really worrisome. Your bread looks wonderful, I am into bread making lately too, have baked so far 5 times in March alone! Will be posting a bread recipe in my next post. This book, what book is it, is it Carol's? I can't read Chinese, am frustrated that Carol's books are not bilingual, have seen her books and her bread recipes looks great! Very relieve to hear that your son is ok... I'll be scared too being in the situation like yours. Rye bread is always denser and less fluffy but it has a earthy and rustic which are really good with soups or butter. 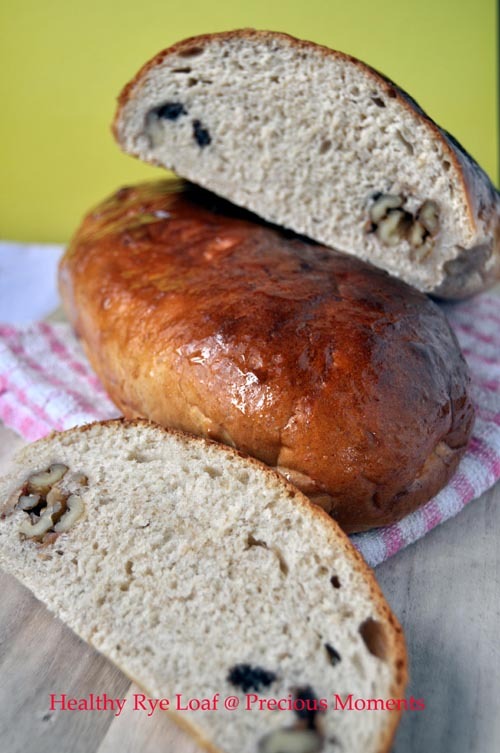 I like the idea of incorporating raisins and walnuts into this Rye loaf. Good to know that your son is fine.